Emily Ballou is a writer of novels and screenplays, and a prize-winning poet. Her book The Darwin Poems, which explores aspects of Darwin’s life and thoughts through the medium of poetry, was recently published by the University of Western Australia Press. 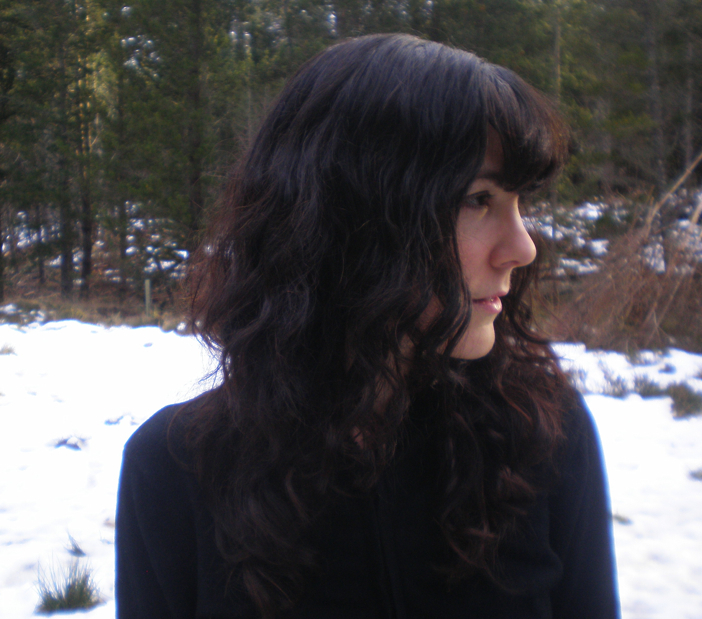 This is an interview with Emily Ballou, who’s a writer of novels and screenplays and, most recently, of poetry, and [who] has written a book about Darwin in verse. We’re very happy to have her to discuss some of these poems today, and? I’d like just to start by asking you about your relationship with Darwin and how you came to the idea of writing about him. Emily Ballou: I’ve lived for the last twenty years in Australia and I was living in the Blue Mountains, in Wentworth Falls, which in the 19th century was called Weatherboard, and Darwin went to Weatherboard on the tail end of the Beagle journey when he was in Australia. He booked an overland trip to Bathurst and stopped at Weatherboard. [He] had been told by Conrad Martens about this view, this waterfall, and he took the walk to the waterfall along the creek. It’s a walk that I did every day. I’ve done that walk hundreds of times. Darwin did it twice. He took it on the way there and on his way back from Bathurst he stopped again because he said that it was exceedingly well worth visiting: it was such a beautiful valley with the waterfalls tumbling down the cliff, and also because of the eucalyptus oil in the air it actually is blue, the air is blue. And he was fascinated by the geology of the area and wondered how it had been formed. But one day I was taking this walk, and just near the cliff, just where the cliff opens out and you see the falls and the valley, I noticed affixed to a rock was a small metal plaque and it said, ?Charles Darwin passed this way.? And although I knew the walk I took was called the Darwin Walk, and that Darwin had visited Wentworth Falls and taken this path, for some reason it was seeing the plaque that really struck me, and I thought, ?Who was this man?? He was 26. The day that he walked to Wentworth Falls, it was reportedly 43 degrees. Australia’s hot, you know, at a much lower temperature. In the kind of clothes that he would have been wearing, he would have been quite miserable and yet he did this walk and was very pleased by it, and I thought, ?Who was this man, and what did he think of this place that I love so much?? And I started to write about Darwin on that walk. So, I wrote several poems from the point of view of Darwin on the walk in the Blue Mountains, and I realised by the third poem that I had a voice that I was really comfortable with and one that seemed to flow quite easily for me, and I thought, perhaps this is a bigger project. At first I thought perhaps I would write about Darwin in Australia, and then as I travelled to the UK and to the Cambridge Library – the Darwin archives – and to Down House, I realised I wanted to write something a bit bigger than that. So The Darwin Poems is really a biography of sorts, a portrait biography of Darwin in verse, that came, really, from that day that I saw the plaque on the stone. I guess, then, I’m curious about what you knew about Darwin before: what sort of place he had in your understanding – your education – before, and also why poetry seemed the right way of achieving this, because as I understand it you hadn’t written poetry before, or at least not a book of poems before. Emily Ballou: Not a book of poems. I’ve been a poet for longer than I’ve been any other form of writer, so this book of poems, my first book of poems, has come after 23 years of being a published poet. I’d written individual poems, but never an entire work. I suppose in some ways, I knew? I was raised as an atheist, but my parents did go to church. We were Unitarians. They went to church for social reasons, but I was always raised as an atheist. My father was a botanist, and my childhood was spent wandering the woods with him and collecting flowers and snakes and frogs, and the childhood photo albums are pretty much all botanical photographs and collections of plants rather than? You know, the children’s photos begin and then they just peter out and it’s just all photographs of flowers and plants. Land shells, interior damp mountains under stones: the elongated yellow Luccinea [sic, recte Succinea] on the wild Banana. that he carried with him, which was an Edinburgh flower painter’s colour samples. You just list? That book is a poem in itself. So, there would have been ways to, just using Darwin’s own words, create a book of very evocative, haiku-like verse. But I wanted to do something? So, I guess there is the poetry within that that suggests poetry for me, and not a novel which would involve a lot of exposition and in a way a fictionalising of Darwin – although I do that to a degree in the poems – that I don’t think I would have felt comfortable with. To me, a book of poems allows you to access many voices, and this book has poems from the point of view of Emma; the children; and even from, I guess, myself, standing outside Darwin; as well as Darwin. So that’s why poetry seemed to me [appropriate], and because when I started writing the poems, the voice took. There was an affinity there between myself and him through this form. 4. How did your research affect your view of Darwin? You did different kinds of research in preparing the book. Your own experiences in the sort of landscapes that Darwin visited; and then looking at his own letters, manuscripts, some of the books that he read and the annotations that he made. I’m interested in how your experience doing this research changed, if it changed, your views of Darwin: if your views of Darwin evolved over the course of the project. Emily Ballou: I saw more of the complex man through the research. There’s something very tangible when you’re creating a character? And in a sense – Darwin already obviously exists as a person, but – in order to access him I had to create a sort of character, I had to understand Darwin as a character as well, so that I could access things that maybe aren’t available for people who are writing a more traditional biography. Going to Down House was wonderful. Seeing all the tools, the things that he collected, walking the sandwalk, and seeing the children’s paintings on the back of manuscripts, holding his notebooks, there’s a physicality that it brings. In a way, when you’re looking at a character, you need to apply the same philosophy that Darwin applied when doing geology according to Lyell, which is: the world of the present will tell you about the past. So, I don’t believe that? Although human history is mediated by context, obviously, and the ideology of the time, I still believe that there is something about us today that can understand something about Darwin the man then. And to pretend that the way he felt about the world was completely alien to us doesn’t make sense to me. So I suppose by being in those places and breathing the kind of air, it’s easier for me to – and to think about the questions I have around faith and death and the processes of the natural world – it’s easier to transport myself back into that time and try to see what he might have felt, I suppose, not just thought. I’m quite interested in the feelings of Darwin, the emotional life of Darwin, and the sensations of Darwin as a body rather than just a mind. Dr White: Yes, I think one of the most striking features of the poems for me was this engagement with this theoretical life but in a way that is very different from how it’s usually approached. So, we’re familiar with his theories: in biology today we understand his work in the form of certain principles of population and selection and this is a very pure and abstract understanding of Darwin’s theory. But you in your poems are able to give a sense of his theory as a living thing: something we can feel, something we can touch. How you achieve this seems partly by weaving in some of this materiality, these objects that you’ve seen and touched, and the kinds of surroundings, the environments in which he’s working, and also by conveying this, kind of, emotional life of the mind. But I wonder if you would like to talk a bit more about that. Emily Ballou: I think, for me, Darwin’s thought? In order to convey it, it couldn’t be a finished thing. I mean, I do want to look at his life, and have looked his life from childhood to death. But obviously, over the course of a life his thinking is evolving, and I wanted to convey somehow the evolution [of them]. So therefore the thoughts are unfinished. Poetry, again, is a great medium for this: for a revelation, a flash of a thought. That great quote Darwin says about geology being ?A capital science to begin, [as] it requires nothing but a bit of reading, thinking, and hammering.?? and the fact that that is, for me, the process of writing poetry as well. living, thinking, that happens in the notebooks, is in relation to the life that has happened already. So, the pleasures of the body that he cites all the time – warmth, exercise, birds singing, or ?Happiness is good food, absence of pain, and sensual pleasure.? – all these things need to be in a portrait of Darwin, I think, because those are experienced as sensations and then later dissected, and I think that’s? None of this appeared fully formed. It came out of his particular existence and his particular body. You said that Darwin’s version of geology sounds to you like poetry and that Darwin himself was a poet in his notebooks, and it seems to me that this relationship between science and poetry is one that you explore quite a lot in the work, and I’m curious again about how this unfolds. One dimension seems to be the experience of the naturalist as an affective experience of observation, experimentation, writing, thinking; this, kind of, embodied mind which feels as well as thinks. How different or similar is that for the scientist and the poet. Emily Ballou: I think Darwin was really interested in the power of the imagination. Even the way that he arrives at ideas is very similar. I look at his notebooks and I think, ?This is a very similar notebook to the notebook I might keep,? in terms of even just the minutiae of the circling of things; the arrows; the marginalia; the way he uses similes to move forward in thought – this is like this, and why; this is not like this – and that’s very similar to the way one writes a poem. I think the way he allows himself to speculate in the notebooks, it’s? Perhaps scientists today don’t feel as comfortable. Maybe they privately speculate and then arrive at the theory and that is what gets tested out on their colleagues, and the speculations are a little bit more hidden, it seems to me, or maybe the idea of speculation is one that’s frowned upon now. But I think Darwin did a lot of speculating, and he used the imagination to make leaps – and to juxtapose two oppositional ideas – he would allow them to come together almost like a collision of rocks, and see what happens. ?What happens when I put this idea and this idea together?? And that’s what a poem is, in a sense. It’s a questioning, an evocation of a moment or a thought. So there’s a lot of similarity, and I think also for me there was something? I’m quite interested in the idea of an evolution of literary influence – a kind of literary evolution – and the way there’s a literary line of descent that can be traced through Darwin’s work and his life from the fact of him carrying Paradise Lost with him on the Beagle, his reading of Wordsworth? If you look at his notebooks of the books he read during the time that he was formulating his species theory, his sketch, he was reading Shakespeare, he was reading six volumes of Wordsworth, he was reading lots of poetry and novels, and he came from this literary heritage with Erasmus [Darwin] having himself influenced Wordsworth’s approach to nature. And also, Mary Shelley was influenced by Erasmus when she wrote Frankenstein. Science fiction? So there’s this whole imaginative world that can be traced through Darwin’s life and I liked the idea of trying to plant myself in that line of descent, just like the branching diagram he created. It’s not just a single line; it’s like a coral, it branches off in different directions and you’re not quite sure how one thing will create the other but you can trace different paths. I think it would be nice to have a poem. Emily Ballou: Would you like me to read? Emily Ballou: This is actually the second poem I ever wrote about Darwin. It is one of the Blue Mountains poems – although in the book I don’t identify it as such – and it’s called Blue Vapour. to be alone with views. but science, an immense solitude. who cite it. Charles did. 7. Why did Darwin avoid making wonder the basis of religion? I find it striking that although Darwin clearly has this Wordsworthian vision of nature as full of wonder and awe and reverence, he doesn’t ever make this the basis for religion. Many of his contemporaries did. I wonder if you have any sense of why Darwin does not make this connection. Emily Ballou: I think Darwin clearly was grappling with the malevolence of nature as well, and the danger inherent within it: the destructiveness, the struggle to survive. All these things were part of the way he saw nature, so it was never just like [in] Wordsworth, this concept to worship, but it carried within it already all sorts of darker forces. I suppose in that way it makes it more akin to a religion, but I think for Darwin it was more complicated than that. For me, I’ve always probably approached? Until I wrote this book, and maybe that’s? To go back to an earlier question, I have altered some of my ideas, maybe not about Darwin, over time, but about nature, in the sense that I probably approached – being an atheist but having a very strong sense of spirituality in nature – I’ve approached nature in a way that’s more akin to Wordsworth in the past. I think now through writing the poems? What kept striking me as I wrote them was how often an evocation of nature within the poem would quickly turn on its head and turn into a moment of death or brutality, but brutality in almost a non-plus sort of fashion. So nature just continues on doing as it does, and things die and the destruction is inherent within it. I don’t think I looked at that as closely before in my under[standing]? I was more likely to just feel the sense of wonder and astonishment at a view rather than closely pulling it apart, seeing all that there was to see within it. 8. Is your Darwin an atheist? I get a sense from your poems that Darwin, for you, is an atheist, although a very gentle one, one who’s not aggressive, who is respectful of the beliefs of others and doesn’t want to cause pain, but [is] nonetheless? Dr White:? an atheist at heart. Is that a fair reading? Emily Ballou: I think that is right. I think, if you look at the history of the word ?agnosticism? in terms of its introduction into Darwin’s life much later than he questioned the nature or the existence of [a] Christian god, I think there was a period of time in which Darwin functioned and existed as an atheist but would never want to use that word for fear of hurting Emma or anyone else around him. I think that was a great word for him to pick up on, later in life, and to be able to use it so as not to injure other people. And he was such a caring person that I think it worked well for him. That’s just my interpretation. The Darwin in my poems is my Darwin. It’s not anyone else’s necessarily, and nor does it necessarily bear a relation, obviously, on the real Darwin. I’m not trying to make any sort of claims, but my sense of applying his thought to the world? I just think they’re incompatible: I think religious feeling and his theories don’t go together. That’s just my take on it, and I also really wanted to use the poems as a vehicle for me to question, because to use the word agnostic kind of pushes the question aside: ?We don’t know, so let’s not say anything more. We don’t know.? But to say, ?I am an atheist? puts the question right there on the table, and I wanted the question to be there and I wanted Darwin to grapple with, ?What if I’m wrong? How do I get through my death, knowing what I know?? : all the fear that is eliminated when one believes in an afterlife suddenly towards the end of one’s life comes storming to the front of consciousness, and I wanted to look at that and I didn’t think it was? So, I guess some of the posturing in, for instance, one of the poems when Darwin dies in the book? there are moments of agnosticism within that poem because it’s a questioning poem, but I think he seemed to me quite clearly making a stronger point on the question of religion throughout his life, at least within his notebooks. Having put this question on the table, it seems the way in which you address it is like the way you address his theoretical life, which is to say: very, very personal, very intimate. It’s not an abstract question which can be answered or argued through a simple kind of weighing of evidence – arguments, reason versus emotion – but these questions are intertwined with our experiences and I wonder if that’s? Maybe we can end with a poem of yours which, I think, captures that? Emily Ballou: This is a poem from the point of view of Darwin’s children. I imagine life with Darwin as a father would be quite fascinating and I suppose I could read through my own childhood and my father in writing this poem. beside the parlour’s marble fire. Emily Ballou: Thank you, Paul.